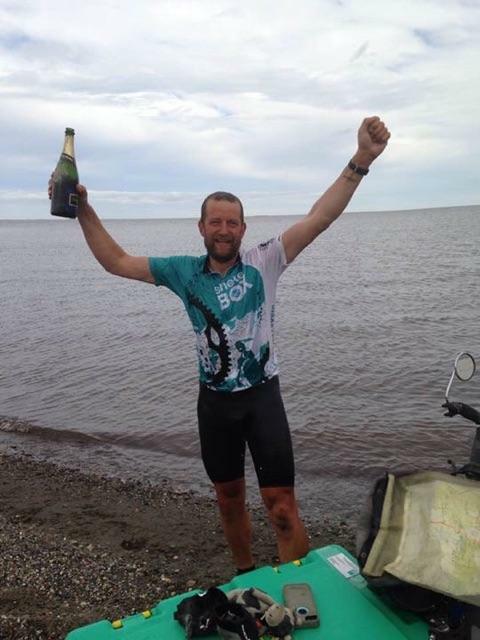 Tim Bridgman has finished cycling the world and has raised £48,000 for Cornish charity ShelterBox. Tim Bridgman set off from his home in Okehampton with his wife Sharon in June 2012 to embark on their around the world 37,0000 mile trip 'North2North'. The journey began in Nordkapp, Norway and Tim and Sharon cycled from Scandinavia to South Africa, and then to finally cycle from Argentina to Alaska. Sadly, things did take a turn for the worse when Tim and Sharon were cycling near the Chilean border in Bolivia 2014, when Sharon was killed by the only car they had seen on the road all day. Tim describes the moment as a "bittersweet end" as he didn’t really feel like celebrating without his wife Sharon but despite this managed to raise a smile with a celebratory drink. It’s been said that together Tim and Sharon have raised more than £48,000 for the charities disaster relief work in the four years they began the journey. Friends from Devon are now joining Tim in Alaska to enjoy a holiday before retuning back to the UK.